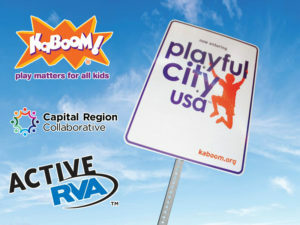 Richmond, VA – Today, the nine localities of the Richmond region were each honored with a 2017 Playful City USA designation by KaBOOM!, a national non-profit organization dedicated to bringing balanced and active play into the daily lives of all kids. The Playful City USA program honors cities and towns across the country for putting the needs of families first so kids can learn, grow and develop important life skills. 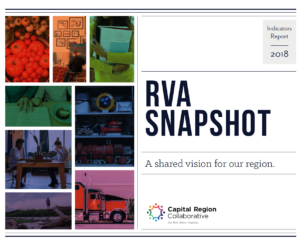 The individual designations of the City of Richmond, the Town of Ashland, and the Counties of Charles City, Chesterfield, Goochland, Hanover, Henrico, New Kent, and Powhatan resulted in RVA becoming the first playful region in the nation. The collaborative effort to apply for the program was led by the Capital Region Collaborative (CRC) and Sports Backers as part of the effort to increase active living habits by transforming ordinary places into playful spaces. 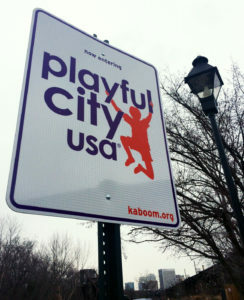 The benefits for being designated as a Playful City USA include national recognition and increased competitive advantage in competitions for grants and other funding opportunities; access to Kaboom!’s playability engagement series, webinars, newsletters, and policy tools; and two highway road signs to showcase the recognition to residents and visitors. This year’s designation follows the 2016 designation of the City of Richmond as a Playful City USA, which resulted from a collaborative effort of the Capital Region Collaborative, Sports Backers, and the city’s Department of Parks, Recreation and Community Facilities. One great outcome from this designation was access to the Play Everywhere Challenge Grant, which Richmond received this year to install Upswing stations with retractable jump ropes and encourage sidewalk play in low-income neighborhoods. This creative solution for neighborhood renewal was even highlighted in the New York Times. The localities were selected because of their dedication to overcoming challenges like toxic stress, behavioral barriers to play, community healing, and 21st century skills and education. Each one is focused on building healthier communities through infrastructure like parks and playgrounds, sports leagues, summer camps, and education opportunities like Challenge Island and The Sprout School. With opportunities like these, and festivals like this weekend’s Dominion Riverrock festival, the region’s opportunities for activity and play are better than ever. As cities are becoming hotbeds for innovation, communities across the country are creating inventive ways to attract and retain residents. Playful City USA honorees are taking bold action to ensure kids have great places to play with the goal of making play the easy choice for all kids, no matter where they live. In addition to the playground down the street, Playful City USA communities are turning grocery stores, vacant lots, crosswalks and sidewalks into opportunities for play. The 2017 Playful City USA recognition includes 258 communities across the country that are transforming ordinary places into playful spaces and using play as a solution to the challenges facing their residents. Nationwide, these communities feature more than 14,000 safe and engaging playspaces that serve more than 4 million kids. To see the full list of Playful City USA communities and to learn more about making play the easy choice for kids, visit www.playfulcityusa.org. The Capital Region Collaborative engages local government, business, and community stakeholders in a process of identifying, prioritizing, and implementing actions that will enhance the quality of life in the greater Richmond Region, which includes the Town of Ashland, the City of Richmond, and the Counties of Charles City, Chesterfield, Goochland, Hanover, Henrico, New Kent, and Powhatan. The Active RVA program of Sports Backers works with partners to make active living a regional priority and improve residents’ quality of life through active living. For over twenty years, Sports Backers has encouraged active lifestyles through events and training teams involving hundreds of thousands of participants. KaBOOM! is a national non-profit dedicated to bringing balanced and active play into the daily lives of all kids, particularly those growing up in poverty in America. KaBOOM! strives to ensure all kids get the childhood they deserve filled with balanced and active play, so they can thrive. Since 1996, KaBOOM! has collaborated with partners to build, open or improve nearly 16,700 playgrounds, engaged more than one million volunteers and served 8.5 million kids. KaBOOM! creates great places to play, inspires communities to promote and support play and works to drive the national discussion about the importance of play in fostering healthy and productive lives.